Fantasy Flight Games has announced For The Greater Good, the next card set for Arkham Horror: The Card Game. This will be the third Mythos Pack in The Circle Undone expansion. As this is a Mythos Pack, both the core set of the Arkham Horror LCG and The Circle Undone expansion will be required to play. For The Greater Good is expected to release in the second quarter of 2019. You can find out more information on the cards and game play of this Mythos Pack in Fantasy Flight’s press release. Add the Feral Brashness and Viciousness of House Greyjoy to your Game Of Thrones: The Card Game and with it all the fury of the kraken. The Ironborn pay the Iron Price and know no rule outside their own. Bring the Isles to bear on your enemies with characters such as Asha and Balon Greyjoy, locations such as Great Wyk and new challenges like Sea Of Blood and When I Woke. Prove to the other Houses of Westeros that the Ironborn, while temporarily forgotten are definitely not gone and a few plays into the game can be a dominant force! The King Of The Isles Expansion for Game Of Thrones: The Card Game is available for pre-order from Fantasy Flight Games or your favorite game retailer now. Due to the upcoming expiration of their current licensing term, Fantasy Flight Games has announced that starting October 22, 2018, they will no longer offer any Android: Netrunner The Card Game products for sale, including playmats and card sleeves. However, before the end, there is one more expansion being released: Reign and Reverie deluxe expansion. This expansion will include cards for every faction and celebrates all things Android: Netrunner. With the end of Android: Netrunner The Card Game, Organized Play will also be drawing to a close and more information for Organized Play and the final Android: Netrunner World Championship can be found here. Fantasy Flight Games launched Android: Netrunner The Card Game in 2012 and has given players a total of two core sets, a campaign expansion, five deluxe expansions, and eight cycles of Data Packs. Not all is lost for the worlds of Android, as Fantasy Flight Games stated that those worlds will continue to be explored in future products. To read more, including thoughts from Lead Developer Michael Boggs and Head of Studio Andrew Navaro, click here. FFG has announced an upcoming release to Legend of the Five Rings: The Card Game. Whispers of Shadow and Steel is a novella set in the fictional land of Rokugan. 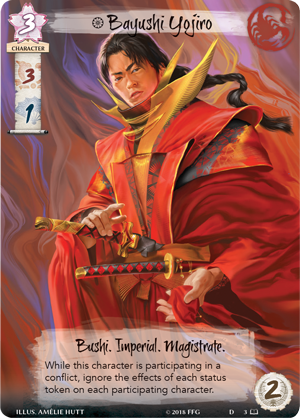 This is the second installment of Legends of the Five Rings Fiction, but the first to include 2 new upgraded art cards that can be used in L5R:TCG. This novella is approximately 100 pages long and features the Scorpion Clan, and specifically, Bayushi Yojiro, one of this clan’s characters. As a Magistrate, Bayushi Yojiro alters the rules of conflicts—in his case, ignoring the effects of status tokens on participating characters. This can enhance the dishonorable Scorpions around him, and erase the bonus of your opponent’s honorable characters. Infiltrator is an attachment that allows you, as an action, to reveal the top card of your opponent’s conflict deck and either play it as if it were in your hand or discard it. As an attachment, you can repeat this process every turn, as long as your infiltrator is in play, and as long as your bid remains higher than your opponent’s. 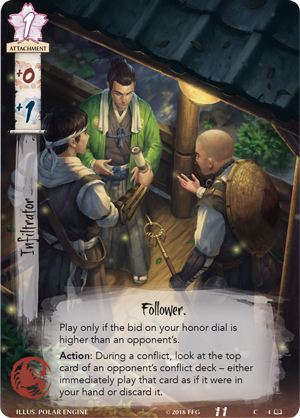 This allows you to infiltrate your opponent’s conflict deck and turn their very best weapons against them—a tactic well befitting a Scorpion. They’re already existing cards (or soon to be existing cards) with full art. They’ll look different than what will be in the standard LCG packs, but will function the same in-game (same stats, abilities, etc.). From a pure gameplay perspective, these promotional cards won’t be exclusive to people who purchase the book, but if you’re looking for the fantastic alt-art cards to make your deck ‘pop’, these are for you. There is yet no release date set for Whispers of Shadow and Steel, but it is available for preorder from both local retailers and FFG. There have been a number of product updates from Fantasy Flight Games with some new cycles on the way for their Living Card Games and expansions for their big box games. Arkham Horror: The Card Game is a Living Card Game (new, fixed content is released each month) for 1-4 players in which players are investigators in a world inspired by H.P. Lovecraft’s fiction. The game has cycles (story arcs) where players create a deck for an investigator which they upgrade through the course of the cycle based on experience which they earn. The Forgotten Age is the next cycle in which players may choose from five new investigators including Ursula Downs, Leo Anderson, Finn Edwards, and Calvin Wright. The latest article on the Fantasy Flight Games website spotlights Calvin Wright. For more details about The Forgotten Age and Calvin Wright read Matt Newman’s article on the Fantasy Flight Games website. In Mansions of Madness 2nd Edition, players are investigators in a world based on H.P. Lovecraft’s fiction. The game takes place in various environments which are represented by tiles. Investigators are represented by miniatures which move across the tiles to encounter horrors and look for clues. The game is assisted by a digital application which adds ambiance and controls the flow of the story. The Sanctum of Twilight expansion adds the Silver Twilight Lodge which is run by the most influential citizens of Arkham. They gather there to do business, plan parades, and lobby politicians … but also to enact secret rituals. The expansion adds two new investigators, Charlie Kane and Lily Chen, as well new spells, items, mechanics, and a new monster. Read the full preview on the Fantasy Flight Games website. A new Rookery variant has been added to A Game of Thrones: The Card Game which encourages a new style of game play. The “Rookery” is a set of twelve cards which players can bring to their game and use to swap with cards in their draw and plot decks. Players can do this after seeing their opponent’s faction and agenda but before they draw their opening hand. In order to celebrate this new Rookery variant a Great Hall event has been added to the 2018 Organized Calendar which will happen after the Regional Championships have begun and will have prize support. These decks are designed to introduce new players to the game and highlight the unique features of each faction. Each pre-constructed deck contains 69 cards which is broken down into a 60 card deck, a faction card, an agenda card, and 7 plot cards. Read a new piece of fiction set in the world of Legend of the Five Rings called “Repentance Does Not Come First” by Robert Denton III. The story focuses on the Phoenix Clan who bear the soul of Rokugan and try to do so without losing their own. Earth Scion Isawa Tadaka senses an approaching darkness and has a plan to stop it but at what cost? You can read the short fiction on their website. This also ties into the Elemental Cycle, the next cycle for the Legend of the Five Rings: The Card Game. This cycle will be released as 6 packs over the course of 6 weeks and emphasizes the five elemental rings of Air, Earth, Fire, Water, and Void. For more details you can check out their press release. This new expansion brings many hallmarks of the deserts of Dorne, House Martell, and the Sand Snakes to the intense tactical mechanics of the card game. The theme of these cards embellish patience and whittling down opponents over time, even when things aren’t going your way. Featuring more of the incredible second edition artwork and attractive new strategies with existing cards, the new expansion is a great addition for fans and new players alike. For more information about this expansion, be sure check out the thorough write up on Fantasy Flight’s website which has previews, explains synergies, and more! EPIC is a two to four player card game by White Wizard games, makers of Star and Hero Realms, where you duke it out as gods to see who is the greatest. This game brings back the play and feel of trading card style games that have been around for years, but without the costly need of buying randomly packaged booster packs. EPIC comes ready to go out of the box, and only adds cards in an LCG style where each pack has the same cards as every other pack of the same name. Previous packs have added new characters you can play as called Tyrants, or just added new cards to the game in Uprising. Well now they are adding new characters to play as in the form of a Pantheon. The first of the two packs features Furios, Father Nature and Maligus, the Dark One, each coming with 12 cards and 3 token cards in the pack so you can play as either deity. Furios is revered by all in the forest, except for Maligus that is, and he seeks to overthrow Furios. But when Furios summons you to his defense, you obey. The second features Helena, the Valiant and Zaltessa, the Huntress, each also with 12 cards and 3 token cards in the pack. Zaltessa will hunt anything and everything under the sun, includes the other gods, but Helena has the bravery and courage to stand up and hunt Zaltessa instead. Look for both of these packs to be on store shelves in January of 2018. You can click here for details on pre-ordering. Fantasy Flight Games have announced The Devil and the Dragon, the fourth Data Pack in the Kitara Cycle for Android: Netrunner. This Data Pack includes three copies of twenty new cards and focuses on the Criminal and Weyland Consortium identities. You will need to own a copy of the Revised Android: Netrunner Core Set in order to use this Data Pack in a tournament legal deck, or the original Android: Netrunner Core Set for standard play. It is currently available for pre-order from your local retailer or from the Fantasy Flight Games website.